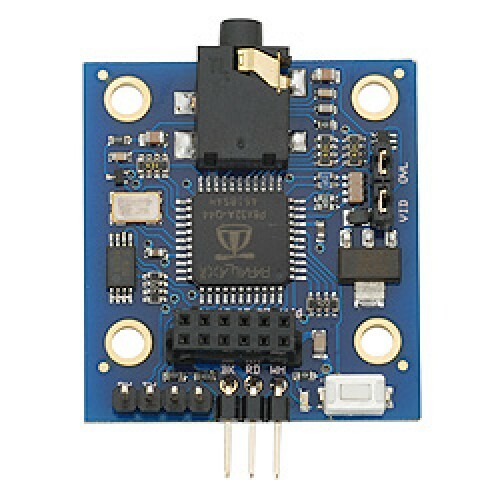 The Propeller Backpack is a compact, multipurpose Propeller-based module that is optimized for audio and video applications. Out of the box, and without programming, it serves as a video character display for your microcontroller, communicate using a simple serial protocol. Any NTSC video monitor plugged into the Backpack’s A/V connector will then display the characters sent by your program – in color, in selectable windows, and with selectable character sizes. The Propeller Backpack is also a fully-capable Propeller development platform, which you can program with Propeller Tool software. Uploading programs to it is a snap, either by using the free LoadBP software via any BASIC Stamp, or directly with the optional Prop Plug. The Propeller Backpack works in conjunction with your own firmware, or that from the Propeller Object Exchange (OBEX). The Propeller Backpack is expandable, too.